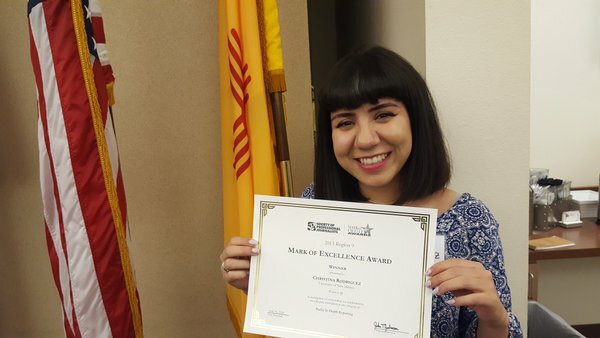 Christina Rodriguez is a senior at the University of New Mexico, majoring in journalism and mass communication through the Interdisciplinary Film and Digital Media Program. Born and raised in Albuquerque, Christina has worked for Popejoy Hall, the Campaign to Elect Michelle Lujan Grisham to Congress and for the IAFF Local 244 Albuquerque Firefighters. At UNM, she is involved with re-establishing the UNM Chapter of the Society of Professional Journalists and creating her own stories through print, video and audio. I work with Doña Ana Communities and I am reaching out for raw audio recording of the interviews you did with three of our members this week. You interviewed Stanley Smith, Jacqui Beck and Michael Seamster. We would really appreciate it!